← Uhh- What the Hell is That? Five years ago, had my station wagon fallen in to a sink hole on my way to Pilates and that deranged Alice revealed our lives full of “firsts” in Japan, I would have asked for one of whatever she had swallowed. What once seemed so unusual has now become very normal. But even now, after 18 months, a new “first” manages to make it to the ever-growing list. 1) For the first time, I am long and sinewy some might even describe me as a tall glass of water. At 5`4″, towering above the crowd, I`m a size XXL. Offspring #2, dwarfs me in height with feet to match. Feet too large for women`s boots, she is forced to sport Men`s snowboarding boots while gracing the slopes. 2) Spouse and I can buy beer out of a vending machine. Somehow it doesn`t explode after making the trip down the shoot. 3) I can now ride a bike while holding an umbrella. Some of you might notice the shadow on the wall indicating the presence of sun. 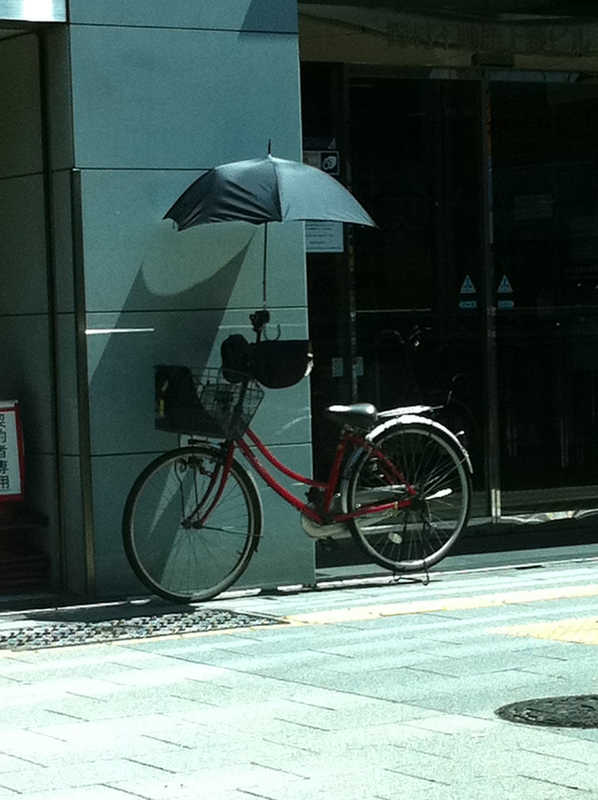 Umbrellas are used in Japan as often to protect from sun as rain. I wish I`d learned this skin saving trick earlier so the Japanese wouldn`t mistake me for the Offspring`s grandmother. 4) I became the first woman to pioneer a new Olympic Snowboarding Event “Olympic Mogul Gymnastics.” In it I performed cartwheels and somersaults while attached to a snowboard down the 1998 Nagano Olympic Mogul course. I was on track for a perfect score until I failed to complete a mid-air 360 degree rotation. 5) The first time I encountered a squat toilet I had no idea how to approach the bench. I am now equally functional on a squat toilet or a Western style. 10) A late school start due to a Solar Eclipse. The Solar Eclipse due to hit Japan on May 21 between 6:00 AM and 9:00 AM will be problematic to the morning commute and potentially dangerous. Apparently it is not just an ugly rumor that staring at the sun, even when it is covered by the moon, can cause eye damage. I guess the school administration thinks parents will do better job than the bus drivers at keeping kids away from windows. This entry was posted in Moving to Japan and tagged Amblerangel, Culture, Emily Cannell, ExPat, Hey From Japan- Notes on Moving, Humor, Japan, Offspring, Solar Eclipse, Tokyo, Travel. Bookmark the permalink. “I drank a large glass of live fish “…..this needs further details, please. + photo/video/movie rights opportunity. Ok- One of my very first posts described this experience. I went back and added it in. It will always remain one of my strongest memories of Japan. What I now know is that being served this dish- all I know is it translates to “dancing stomach” because- well- that`s what it does- is a hall mark of a very fine sushi restaurant and highlights the freshness of the sushi. I was so afraid I was going to laugh and spit those fish all over the sushi chef…. Thanks for the link – I must have missed that post ….I would have remembered….You are definitely much more “hard-core” than I am – we’ve managed to dodge most of the “I’m-not-sure-I-can-get-that-down” food options. I would love to see a picture of that! Sounds like stage fright could be an issue for first timers…. Yes, I agree with tomorrowslices…what is this live fish drinking? Squat toliets….oh dear, never seen one, hope I never do…eek. That`s how they are used here- parasols during the sunny weather. You are very smart to do that. We did that in Arizona when at sporting events because it is so much cooler in the shade. Now I can`t live without my hats. The squat toilets are always a surprise- especially when the Japanese have the high tech Toto toilets that can fly to the moon and back. What a great recap of all the hilarious moments you’ve experienced in Japan so far. Looking forward to that Solar Eclipse! I hope I`m not blind afterward. PS: Thanks for a great laugh! Fortunately this was before Offspring #1 got his GoPro helmet cam. Otherwise it would have been on camera. Including the part where I snowboarded over the one tiny part of grass in the middle of the slope. Just a note- a snowboard does comes to a complete stop when it encounters grass whereas everything attached to the snowboard continues in a forward trajectory. I had so much grass in my helmet I looked like I had been practicing combat maneuvers. Hey girl!! I need an email address from you that I can send some Trinity info. Your way. Love you!!! Let me just say how impressed I am by the squat toilet functionality. My daughter is still traumatized from the one time she had to use one because we couldn’t find a Western style toilet. And a great amount of skill to not miss and pee on the floor. Or your clothes. I like to think of it as a pilates move- balance, and strength all rolled in to one- with the added excitement of some target practice. #7 sounds familiar. Not the “snow monkeys” bit, but the bit about instructing Willie what to tell the doctor in case I can’t speak for myself. The only time I stretched the truth was on the temple visit where I claimed celestial beings were chasing me. I admit, that was not quite true, but- we were at the temple itself. 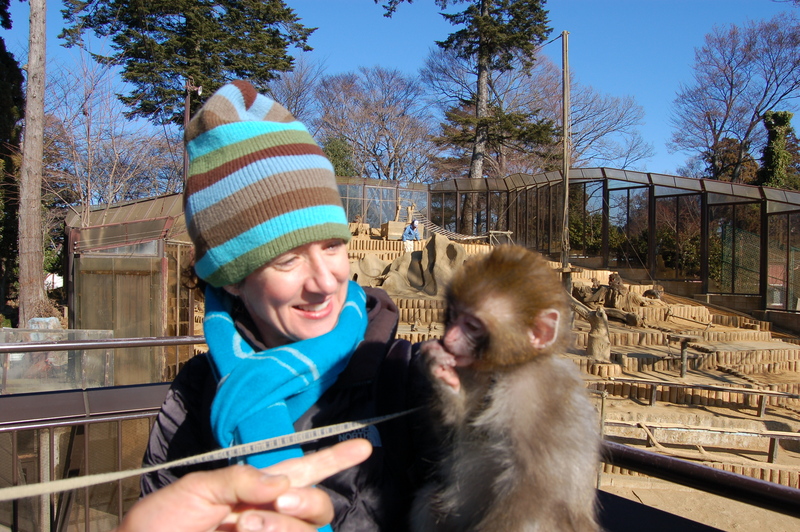 I wrote about the monkey bite in the context of a hike up Mt Takao so you probably already read it. I like to get good mileage out of a funny line. I guess I`ll have to put that one away now. I didn’t know that you were only 5’4″! I say “only” because I’m 5’4″ and you always seemed so tall in all of your photos. Now I know the secret – everyone else is that much shorter than you. You certainly don’t need to wear any shoes with heels! And don’t forget the wedge heels!!! A Ouiser-san wardrobe staple since college!! The secret to longer looking legs. Ah yes I remember all your strategies for height well. I adopted a few of them myself (at 5′ 3″ and shrinking). You did- just sometimes you wore shoes of a different color- at the same time. Squat toilet ? Never saw that. How are you to read the newspaper on such a thing ? This is more suited for a quick scan of the headlines. Your squat toilets in Japan look a whole lot nicer and cleaner than the ones in Vietnam. And are you really only 5.4. I would have sworn you were taller than that. You must have been wearing some serious heels when I met you. I think you were–plus, I was wearing flats. Kathy- when I have on 3″ of wedge and 3″ of hair- I’m closing in on 6 feet. Pretty sweet trick huh? I love having ‘firsts’ with you. You have saved me from so much embarassment, if i ever go to Japan. Although, I have bad knees and my balance is, well, not so hot. Also, there is NO way I’d be gracious enough to swallow eyeballs. Think I might stay here. Really though, I love learning about the Japanese culture through you. Thank you! Thanks so much PW!The good and bad news I guess about the Japanese is that as you`re making all these cultural mistakes they don`t even blink an eye! I’m happy the baby snow monkey didn’t render you incapacitated. It just leaves you more opportunities for “firsts”! Well- see- my hair defies gravity and grows up- not down. So I don`t really have much choice in the matter of puffiness. Remember Kid N Play? I inspired that look. Thanks Emiel- and thanks for the Tweet! Am loving your new web site. Well- not so new anymore. 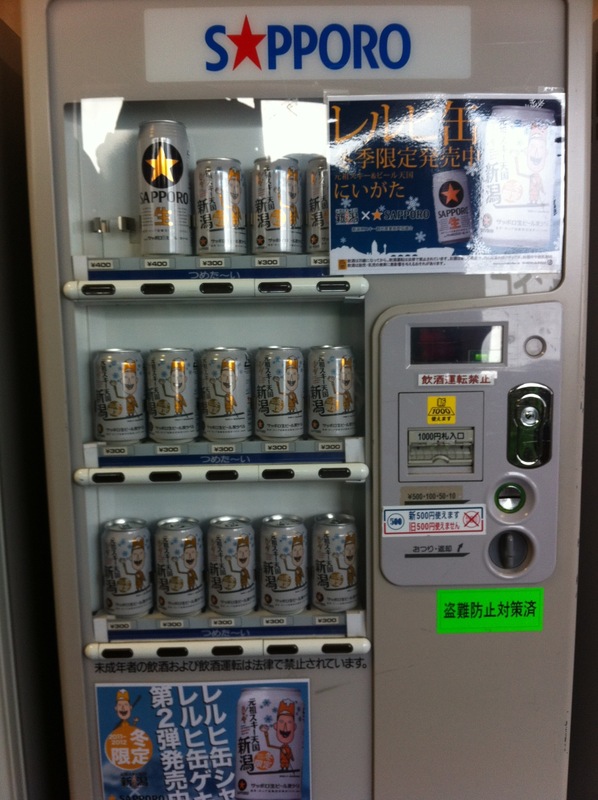 Beer out of a vending machine? What fantastic black sorcery is this? There’re actually vending machines at National University Singapore that take hugs in exchange for drinks. If these two variations could be bred to create a beautiful mongrel beer, hugging vender I’d be a very happy man! Hilarious ComplexSymmetry- what is it like to be hugged by a drink machine? Sort of stiff I guess. But- a free drink is a free drink in my book! Thanks for stopping in!You are so right, a cross breed could be very interesting. Haha~ reminds me of the days when I first visit and live in Western cultured country. Almost everything is shocking to me. Cultural shock often takes us when we are least prepared or conscious about it. But gradually, I get used to it. Hope you enjoy your time in Japan. It’s a lovely country. Thanks for reading! I will be getting to all your comments shortly! Love them! Yes- I bet a Western culture is just as hard to get used to when one is from an Eastern one. I agree. So far it`s been wonderful- a very easy culture to adapt to! Thanks for the comment. I seriously cannot get over the squat toilet. Don’t get me wrong, I can go in the woods as easily as the next person but trying to hit a hole ? I would surely trip over/into it or soak my clothing trying to aim. I commend you. Just aim and shoot hon. When we go to Turkey I am a foot taller than everyone and you have to squat over some of the toilets, but I have never (and don’t think I could) swallow a glass of live fish. I read the link to the old blog and almost died thinking about it going down. 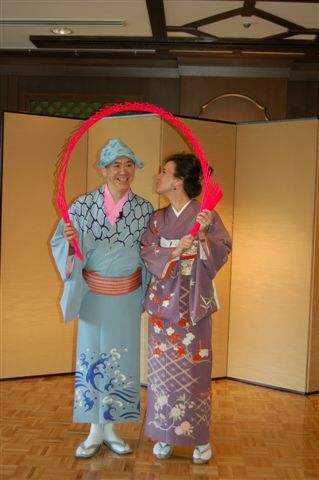 Also had no clue about the kimono. I also always thought they looked very comfortable! That was what was so surprising to me about the kimono! A robe it ain`t. Have fun in Turkey! I hear it is a wonderful place. I bet the food is wonderful! It’s funny that they still have squat toilets in Japan, next to all those supersonic ones. The one in my flat had heated seats, a pipe that popped out of nowhere at the press of a button to clean you up and when you pressed another button you were assaulted by hot air, a kind of pubic hair dryer. I forget what the other buttons did. Squatting is still widespread in France, apparently. I hear it’s a more natural position assuming you’re healthy and have removed any loose clothing. I`ve certainly heard that about birthing babies! So it would make some sense. Have not heard that about France. I love all the buttons- noise maker, deodorizer, super flush, regular flush, heat the seat, water aimed at three locations in the nether regions…. of course the list is longer the more expensive the toilet! Those are just the basics. Squatting toilets are better for your stomach, also cleaner, since you won’t have to touch anything, more economical (less material and water needed) as well as faster (try it!). In the old days many Japanese women used to give birth in the same position, but needing a little more support they had “birthing hooks” in the ceiling in special rooms. 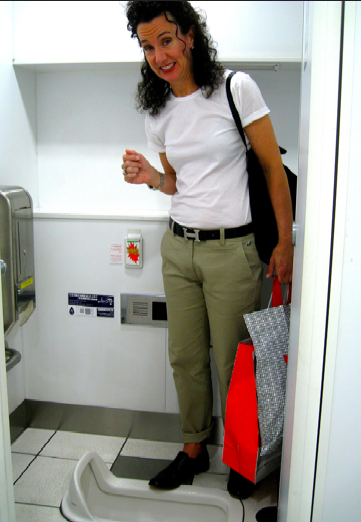 But I agree, after having used one of those high tech toilets the thought of going back to our revolting western low-tech toilets is unpleasant… Not one of my friends have left Japan without at some point wondering aloud: “I wonder if I can buy one of these and bring it back home?”. I know. I`m buying one when we go back. A birthing hook? Ouch. maybe that`s why no one is having babies here.